In Memoriam to Joseph T. McLaughlin, Esq. All News In Memoriam to Joseph T. McLaughlin, Esq. 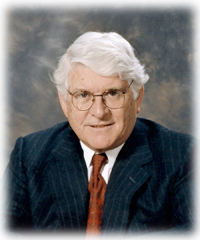 JAMS Remembers Joseph T. McLaughlin, Esq. One of New York’s most esteemed neutrals, Joe McLaughlin joined JAMS in 2008 and built a successful ADR practice primarily focusing on resolving complex business commercial and international disputes. He was highly respected by his colleagues and clients. In private practice, he was Of Counsel at Bingham McCutcheon LLP, and Partner and Head of Litigation at Shearman & Sterling. In addition, Joe oversaw international legal and compliance issues in 60 countries as the Executive Vice President of Legal and Regulatory Affairs at Credit Suisse First Boston. He also served as Chair of the Credit Suisse Foundation, was a contributor to the JAMS Foundation, and was involved in many community organizations such as Good Shepherd Services, Resources for Children with Special Needs, International House at Columbia University, and Brooklyn Museum. Joe shared his deep knowledge of the law by teaching ADR at Fordham Law School, Cornell Law School, American Law Institute and Practising Law Institute. Joe will be remembered for his sharp intellect, openness, generosity and commitment to ADR. JAMS and the legal community will greatly miss him.